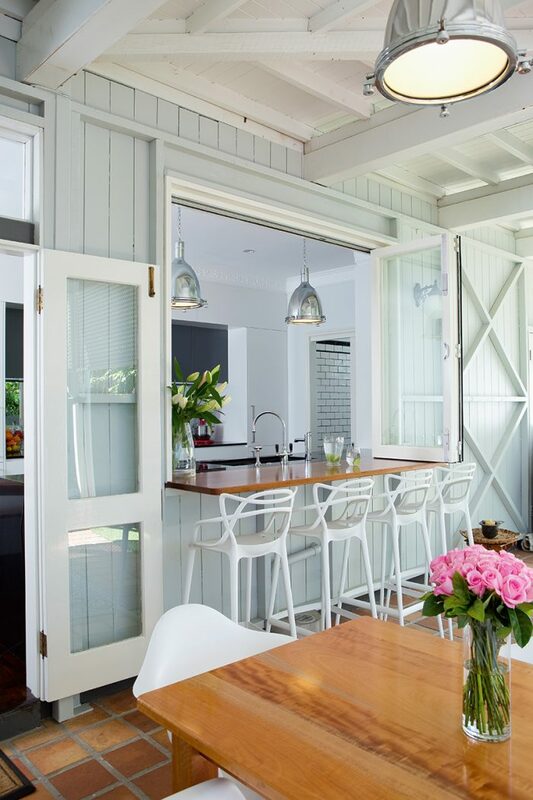 QH Tours The Newly-Renovated Kitchen Of Brisbane Newsreader Melissa Downes. And so a year later, armed with a folder of magazine clippings and design ideas, Melissa approached Style by Design kitchens who came recommended by a friend. “Stuart from Style by Design was someone that we could work well with – he understood what we wanted and also allowed us to change our minds,” says Melissa. “He gave us the guidance we needed, but we always had the final say. 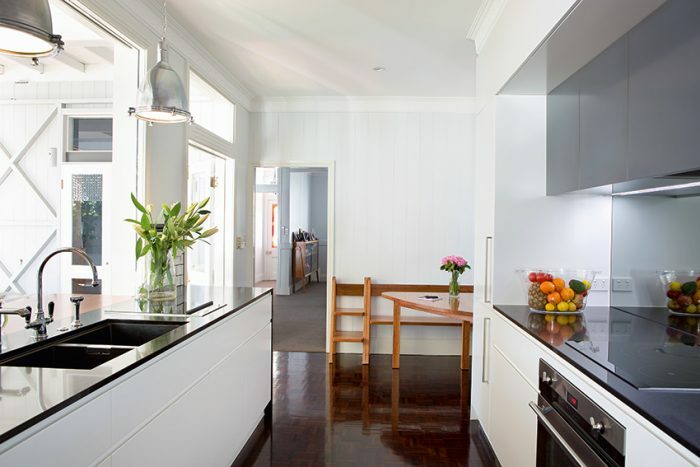 He was great.” The original kitchen was a compact, dark room which felt removed from the rest of the free-flowing home, red timber parquetry floors and heavy wooden cabinetry further enclosing the space. One small window provided the only natural light, and occupants had to walk outside to reach the laundry and bathroom located behind. “We didn’t have a lot of design choice in terms of the layout,” Melissa says. “It was a small space, so one of the big things we wanted to do was put an additional door in.” That new door, which replaced the existing stove, now leads to a spacious butler’s kitchen which houses the pantries, additional kitchen storage as well as a bathroom and laundry. 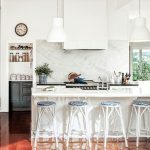 A monochromatic scheme (black Caesarstone bench tops and white subway tiles are teamed with handle-less white cabinetry) is a timeless choice and echoes the classic-meets-modern style which characterises the rest of the home. 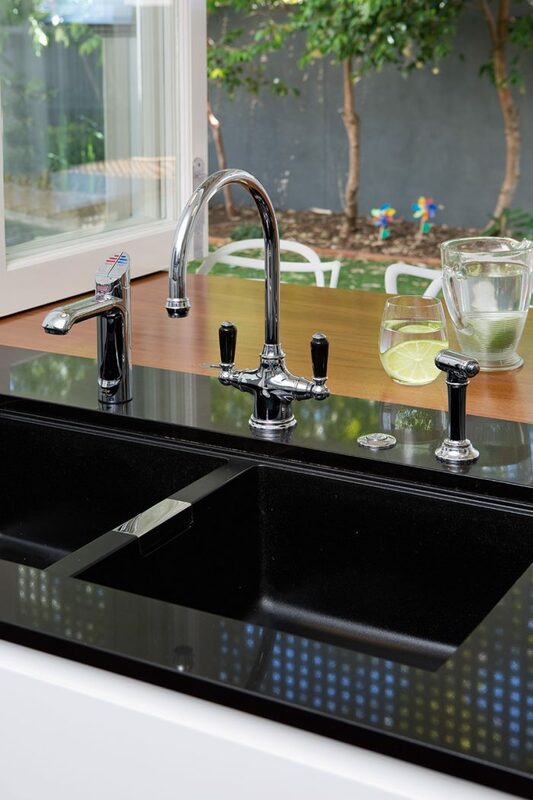 “We had chosen something else for the bench tops, but at the eleventh hour we thought ‘No, we’re going black!’” Melissa says. “We had been scared off black by a lot of people saying it was hard to keep clean, but we don’t find that it’s any worse than other bench tops.” The main kitchen combines stretches of seamless charcoal and white cabinetry with more black Caesarstone, two feature industrial pendants hanging above a sleek black double sink which sits parallel to a mirrored splash back, a clever addition which visually enlarges the space and brings the green of the garden inside. The original parquetry floors remain, but a darker stain has brought them into the 21st Century, adding some warmth and texture to the minimalist design. 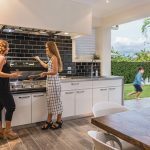 A wide open window completely opens the kitchen up to an outdoor breakfast bar, an uninterrupted stretch of bench top creating flow from inside to out. A generous outdoor dining table lovingly created by Melissa’s father in law (who also crafted the corner setting inside) is bordered by modern white chairs by Matt Blatt, echoing the same aesthetic as the white bar stools which reside nearby. “No matter where you are around the kitchen, you all feel connected,” Melissa comments. “You can be sitting at the outdoor table, the indoor table, the bench, and you can all be talking to each other. 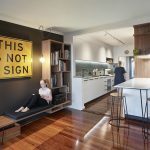 Having two kids, we wanted to have that inclusive, family feel.” Despite sticking to a budget, Melissa and her husband were able to splurge on a few little luxuries – a Zip tap which supplies boiling, chilled and sparkling water, a Teppanyaki plate and mechanical push-close cupboards which enable users to easily access items stored up high. But it’s the dishwasher that Melissa names as her favourite inclusion. “After having no dishwasher for over a year, getting one was a hallelujah moment!” she laughs. For someone who was adamant about respecting the home’s original design, there could be no greater compliment than one that came from the previous owner. “We still keep in touch with the former owner who did the initial renovations some twenty years ago,” Melissa says. 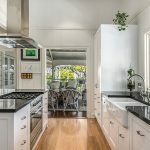 “When she came over to have a look she said that’s the way the kitchen was always supposed to be.” A fitting description for a considered and ultimately beautiful renovation.